Home :: GIFT TAGS :: Airmail Gift Tag Set: Wishing You. . .
Airmail Gift Tag Set: Wishing You a Wonderful. 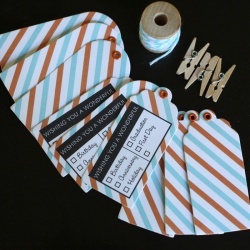 . .
Adorn that pretty package with the perfect gift tag! Set of 9 airmail gift tags (3 scallop, 3 round, 3 text). Text reads: "Wishing You a Wonderful. . .